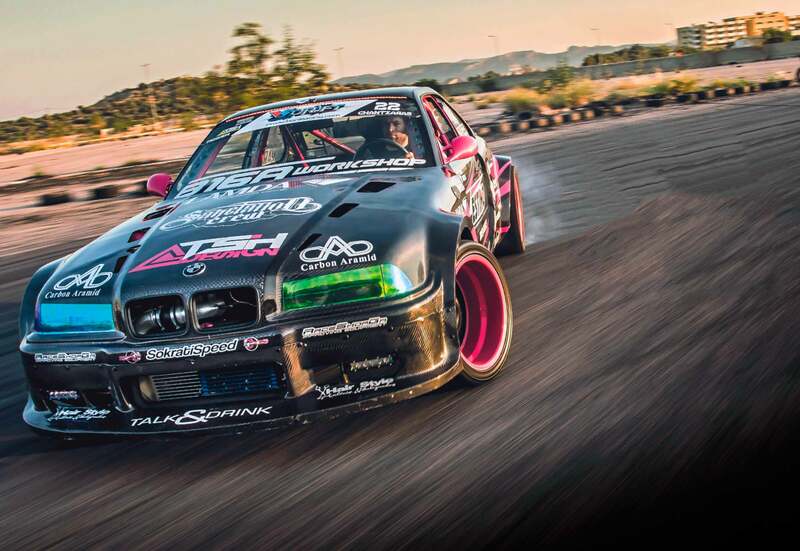 Carbon wide-body turbo BMW M3 E36 outrageous E36 drift build. Wrapped in an incredible carbon wide-body, this wild-looking turbo E36 M3 is one hell of a drift machine. Words: Daniel Bevis. Photos: GK Production. 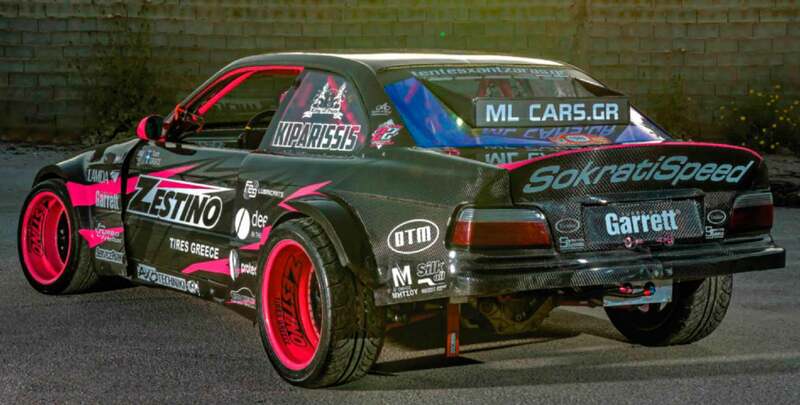 When it comes to drift cars they’ve got to be exceptionally good at going sideways – that goes without saying, really – but they also need to make a big impact. Have you ever seen a shy and retiring, subtle drift build? We’re betting the answer is no. When you’re competing in a sport that’s as wild as this, you have to go to great lengths to make sure that your machine stands out and gets the attention it deserves. This E36 M3, with its outrageous stance and black and pink colour scheme, is not a car that’s ever going to be able to escape anyone’s attention but, usefully, it’s also an absolutely ferocious drift build, powered by a ferocious turbocharged engine and designed to do nothing else but be the best at going sideways. Let’s be honest, it’s absolutely frickin’ awesome. 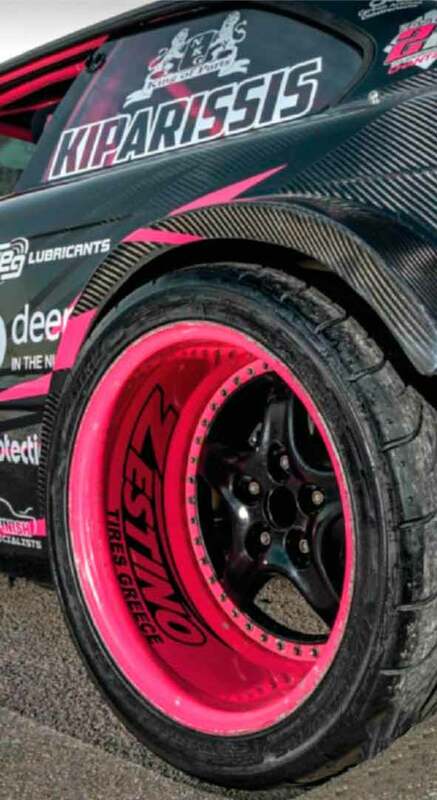 It’s also extreme to an almost unbelievable degree – check out the rear track, it’s ludicrously wide; the inside rim of the wheels is closer to the original arch line than the outer, which sticks way beyond like some marine outrigger. It takes a hell of a custom bodywork approach to house this sort of lunacy. Looks like we’d better get to know the owner of this thing, sharpish. While we stick the kettle on, perhaps you’d like to take a moment to open up YouTube and type in the keywords ‘Chantzaras E36.’ Got it? Yep, that’s the car, check out how it rasps and howls like a hornets’ nest that’s inexplicably become trapped in some manner of impenetrable Perspex dome. Immerse yourself in the theatre of the spectacle for a few moments, get to know the car’s balletic poise, enjoy t he improbable lock angles, let the fingers of its wiles slip subtly into your very soul. Back with us? OK. let’s talk to the man you’ve seen behind the wheel, Christos Chantzaras, and see just where all this came from. 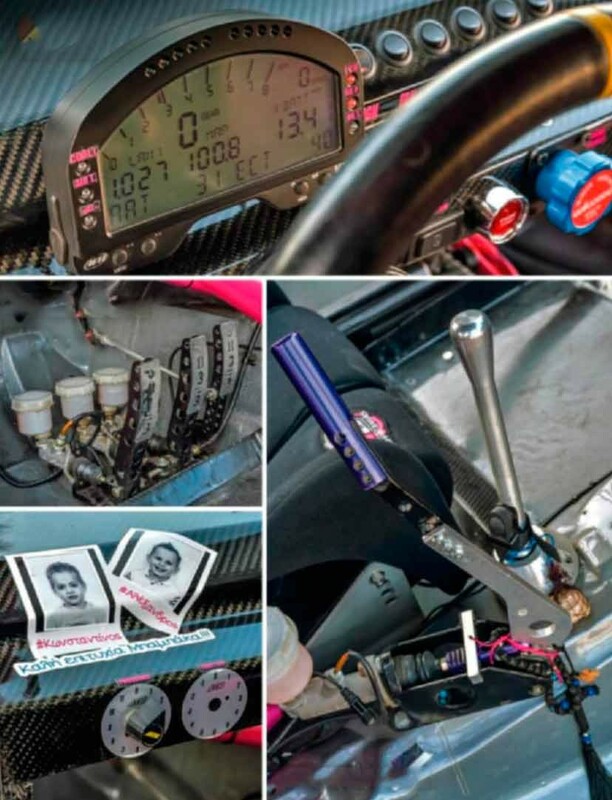 Tin a professional drift driver, and I’ve been a fan of BMWs since childhood,” he explains. “All my father’s cars were BMWs, and I just love the philosophy of the brand - plus, you know, rear-wheel drive...” Yep, there’s an obvious link between the enthusiasm of the child and the livelihood of the man, and ever since he bought his first car - an E46 316Ci - it's been Bavaria or bust for this effervescent Greek horsepower junkie. “I bought the E46 coupe in 2000 because, in my opinion, it was the most beautiful car at the time,” he reasons, ‘and it wasn't long before I turbocharged it...” This, as you’ve probably pieced together by this point, speaks volumes for Christos’ approach to car ownership. Cool cars just aren’t cool enough in factory form, they need to be faster, unique, more extreme-and when you stir in the unhinged lunacy of drift culture, all bets are off. Now, at this moment in the tale it’s probably best to address the rather sizeable elephant in the room and confirm that, yes, this is a genuine E36 M3. This will no doubt upset a few people, but its worth bearing in mind two very important things: firstly it’s not like he’s shot a dodo, there are still quite a few E36 M3s in the world. And secondly, what someone chooses to do to their own car isn’t something that anybody else needs to fret about. Live and let live. And on that note, this M3 really is living its best life now - just look at the thing, it’s magnificently absurd. Sure, its original designers might possibly be vexed by the notion of the entire bodywork having been thrown away and replaced, but there’s a loving tribute here. It may have taken Christos’ team six months to hand craft this custom wide-body kit from carbon fibre, but it’s remarkably faithful to the E36’s lines in the principal details, isn’t it? If you’re making a fresh new body from scratch you can pretty much make it look like whatever you want, so it demonstrates admirable restraint that this car is still recognisably E36-shaped. Alright, perhaps ‘restraint’ isn’t the most appropriate term to use when talking about this car. The lock on the front wheels is so extravagant they almost turn at right angles, whereas the dish of those insanely pushed-out rear wheels could happily accommodate a small child. 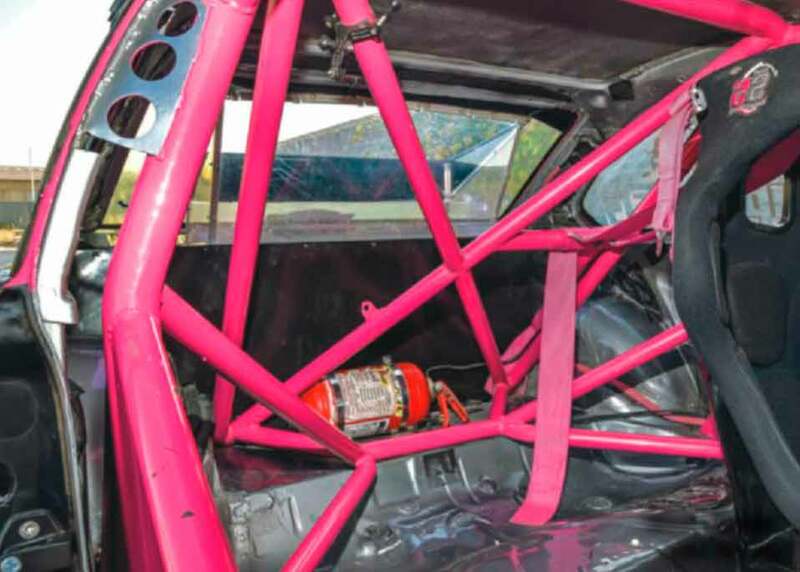 There’s quite a lot of pink on display too, and the whole rear end of the car is a cacophonous riot of slashed angles, with the integrated ducktail sitting behind the vast window-mounted scoop ramming vast gobs of fresh air into the rear-mounted radiator. Christos evidently isn’t a man who does things by halves. “I found the car advertised online, and it was a totally stock M3 at the time,” he intimates. “From the first time I saw it, I knew it’d be my drift car! It’s the best car, the perfect base to make the right modifications for drifting; we started by modifying the stock engine with a performance air filter and exhaust system, before adding nitrous oxide. After a year we replaced the nitrous with a supercharger setup, and after another year we went with turbocharging.” It’s a mighty unit, too – a Garrett GTX3582R Gen 2 ballbearing billet turbo on a custom exhaust manifold, with twin Tial 38mm external wastegates and a Tial BOV, the screamer pipe pointing amusingly upwards at the same angle that the canted block sits. Indeed, that whole area of the car represents some fairly brutal surgery; while the inner wing elements incorporating the top mounts remain in situ, the front end has been unceremoniously scythed off and replaced by a tube-frame which houses the myriad coolers and pipework required to get this mighty turbo charging as hard as the demands of top-flight drifting require. 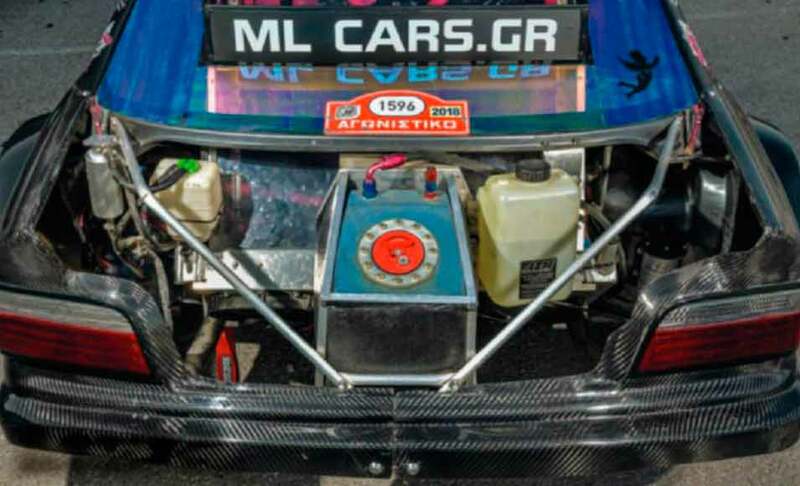 And naturally it hasn’t just been a case of bolting the mighty Garrett to the stock M3 motor and seeing if it goes pop – Christos has been ruthless in the upgrades. “We’ve replaced so many parts in the engine,” he enthuses. 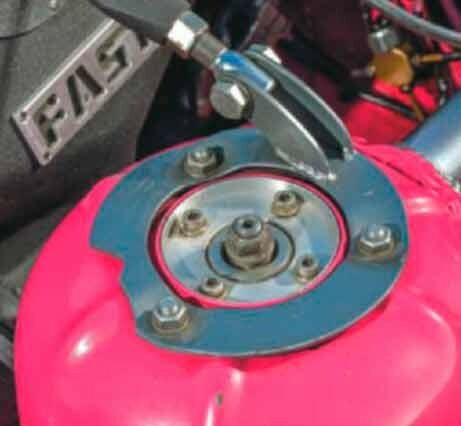 “The pistons, rods, valve springs and retainers, custom VANOS elimination kit, crankshaft plate, fuel rail and fuel regulator, injectors, crankshaft pulley… it took six months to finish this engine setup.” It’s been built without compromise, and this is demonstrated by its reliability – he may thrive on getting his toe down and giving the motor death, but Christos is out wringing its neck on a regular basis. This thing was basically built for abuse, it loves it. “We replaced the stock suspension with D2 Drift Series coilovers, because we wanted to succeed with very good traction,” he continues. 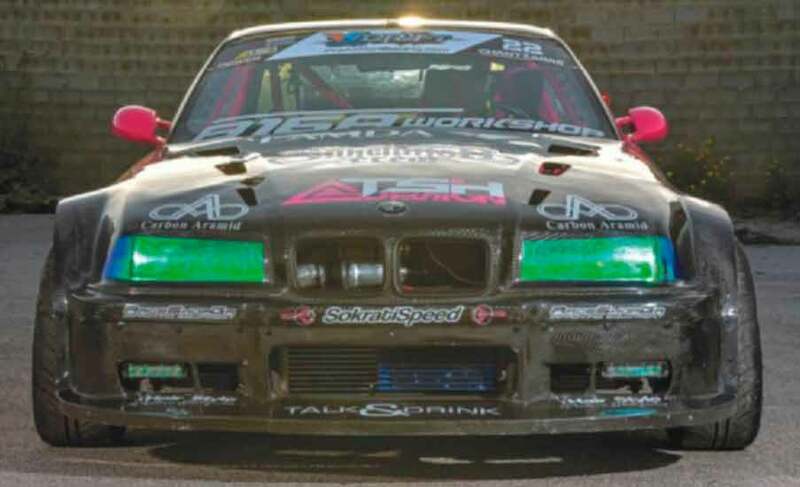 “The chassis has been extensively lightened, and I’m particularly proud of the front arm system, that’s my favourite modification on the car – it’s fully custom, it works beautifully, and this is the only E36 in the world that has it!” Weight-saving has clearly been a priority here; the obsessive pursuit of achieving the lowest possible kerb weight is one of the reasons why Christos and his drift team hand-crafted the carbon body, and if you crane your neck through the window you’ll spot that the dash is a custom carbon creation too. “The interior was designed solely around the requirements of a race car,” he says. 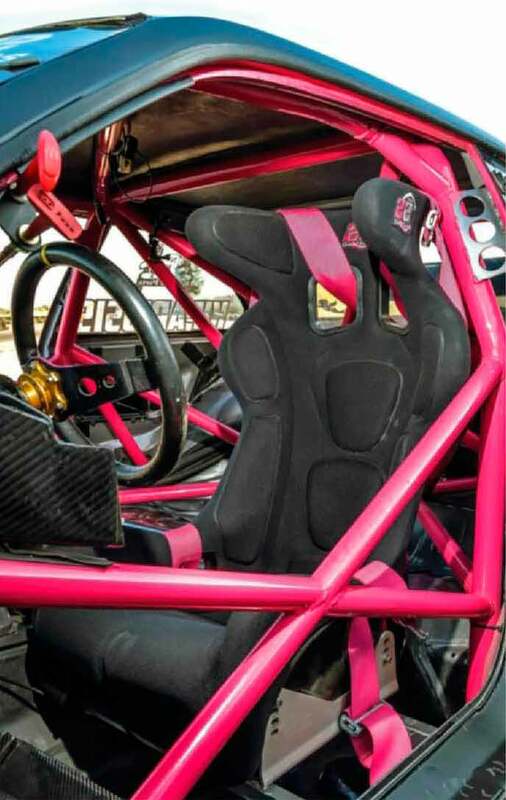 “That took around four to five months to complete; as well as the custom dash, there’s the full FIA-approved roll-cage, hydraulic handbrake, bias pedal box, fibreglass bucket seat, and the AiM Strada dash to keep an eye on the vital signs.” All-in-all, this build represents around two years of Christos’ life, along with countless man-hours of the drift team that surrounds him, and it was worth every last second. When he’s out on track, the featherweight slider deploying its mighty horsepower, there’s nothing else in the world that can quite match the spectacle. This car was built for a very specific purpose and it fulfils its role admirably. Future plans include the fitment of a sequential transmission, although for the time being Christos is busy enough getting liberally sideways in his infinitely nutty creation, doing sterling work to eradicate Greece’s surplus rubber mountain and having a jolly good time in the process. ‘No fear, no mercy,’ says the custom airbrushing on the cam cover, and that sums up the attitudes of both Christos and his E36 M3 perfectly. AM Strada dash display. Wilwood pedal box. Outrageous custom splits are all about the dish. Custom lightweight chassis. Custom front arm setup. 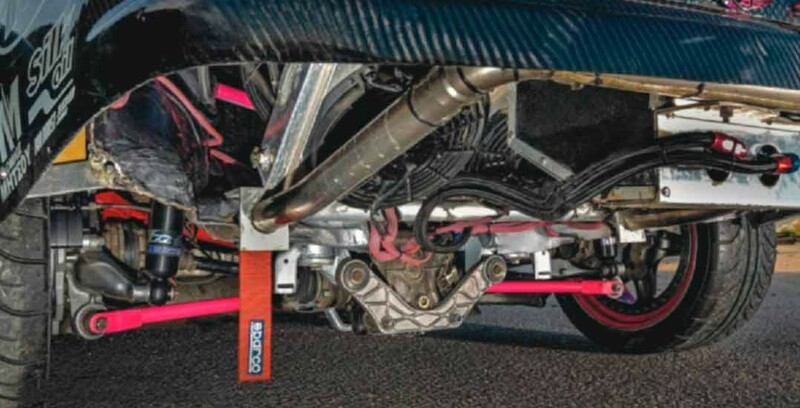 Wild custom carbon wide-body Fuel cell and radiator hang above the ground in the boot Vibrant FIA multipoint roll-cage. The World’s Fastest BMW M3 E36… On salt!